Neptune's Defenders: Black Sand Beaches...? Not quite... The Pensacola News Journal reports oil has made its way to the panhandle. 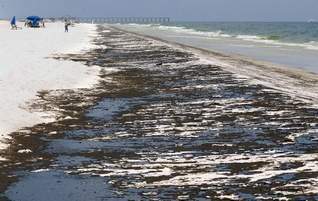 "For the first time since the Gulf of Mexico oil spill 65 days ago, emulsified oil in large patches stained the sugar-white sand on Pensacola Beach. Large numbers of tar balls continued to roll ashore. A section of the Gulf along Pensacola Beach — but not the beach itself — was closed to swimming and wading after a health advisory was issued by the Escambia County Health Department." Just wait until the majority of the oil starts washing ashore! This is just the beginning.